Got Feedback? Love to hear from you. Leave a comment below or on our Facebook page. 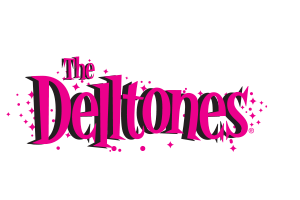 Hi Deltones what a great band you have been. Seen you guys a few times live, the last time at Broncos leagues club. Just been showing our granddaughter and boyfriend some of your songs. I think you just got a couple of more fans. All the best Peewees voice is so cool. Firstly sorry to hear about the floods you guys are having up in townsville I hope you and the family are OK.
Lovely to hear from you and hope all is well in Tasmania. Peewee is taking a very long break from touring and when he decides to tour it will be with a new line up. I still have some t shirts available let me know the size and which ones you are wanting. All the best for the New Year to you too. HI Carla and Peewee miss you both im not well at moment i need heart surgery soon any t-shirts please carla size xL please carla any t-shirt with the guys please love to you all leanne mcdonald. We were in the same class at Paddo, same age. Havn’t seen you for a couple of years since Bronte days. Hope to see you again one day. I live at Redcliffe.. Fantastic sounds I’ve been listening to via youtube as a 75-year-old here in Florids and still stuck in the 50s. Greatness. Would surely have enjoyed dancing to Come Go With Me, etc. Whilst I was looking in again on the website in hope, I should take a moment to say thank you. I have been to many of your shows from 1986, and I think the last time was Batemans Bay in 2013. Whether there has been six, five, or four of you on stage, it was always a great show. Would love to see a show in this the 60th year since you began, but then again I have had so much joy from your shows over the years, it might be greedy to ask for more. Enjoyed the book btw, best wishes to all, and your families. Thank you for your reflections At this stage Peewee is taking a long break. Over the years there has been many Delltones transformations, and this will be yet another. So glad you enjoyed the book. hey peewee i do a inpersonation of you when i sing the delltones songs. peewee keep on rocking on. The Delltones are so groovy and cool you guys rock!! When are The Delltones coming back to Twin Towns ???? You guys are just marvellous and I can’t get enough of you. I bought your CD and sent it overseas to an internet radio guys, who has his own show. He actually played a few of your songs you did on the last show at Twin Towns (I was there) and everyone LOVED them. He played “Gee/You’re The Limit/Come A Little Bit Closer” ….. and then he played “Hangin’ Five” and “Get A Little Dirt On Your Hands”…….it went over very very well. I am a 15 year old boy from austria and I am grow up listening to doowop and rock n roll. I have a big record collection and I have every 45 released by the Delltones from 1959 until 1965. Keep up the awesome music. Love your act. Been to the last two shows in Bunbury. Cannot understand why you don’t come out after your shows to meet the fans. Jon English did it and Leo Sayer is a gentleman but when we asked if you guys were coming out we were told no. I am your biggest fan……LUV doo-wop and have a HUGE collection of it. Used to sing in a band, years & years ago. In fact, I remember when you guys appeared at the Barklay Hotel in Mt Isa, and the band I was in were doing a gig upstairs. We came down in our break to have a listen to The Delltones and were blown away. After our gig finished, we came downstairs again to meet all you guys, which was just terrific. Pee Wee invited me to a party, and when I asked him how many were going to the party, he said “you & me”………hahahaha……. and I said ‘can I bring my husband along?” He was also in my band. It was really funny and I’ll never forget it. Are you guys going to do another show at Twin Towns Services Club at Tweed Heads at all this year? I went to your show last year and absolutely LOVED it. Best wishes to all of you and your familes. I do hope you do another show at Twin Towns soon. Don’t forget – KEEP RAGING TO STOP THE AGEING. Would love to see you perform agin,,,, my kids need to see you to appreciate what we all know as great Rock and Roll. Love you guys. As many have said, love to see you guys again. My suggestion would be to ask Danny to come back for a Final Goodbye Australian Tour. It would be great, include Melbourne of course. Love the music!! I can nicely tell you Pee Wee about promoting your very interesting book of yours in the promote of the book for everybody And Delltone Fan will always find it worth reading the book by especially you can sign the book for everybody And Delltone Fan at the bookshop will be very tricky for especially you iit’s going to be hard to promote your book by especially you from off Kyra Semmler From Rockhampton Queensland Pee Wee. Nevy McLean) on my very private home number is (07) 49275967 of Kyra’s really wants Phoenix’s Lead Singer Nevin McLean (Nev McLean/Nevy McLean) ONLY please Pee Wee please Pee Wee please Pee Wee only for a Delltone Fan named Kyra Semmler From Rockhampton Queensland Pee Wee. When will The Delltones come back to Rockhampton again? Will The Delltones do a new Concert Tour in The Pilbeam Theatre here in Rockhampton Queensland? Could especially you please nicely answer the two good questions on The Delltones only for a Delltone Fan named Kyra Semmler please Pee Wee please Pee Wee please Pee Wee please Pee Wee from off Kyra Semmler From Rockhampton Queensland Pee Wee. Love From Kyra Semmler From Rockhampton Queensland Australia Pee Wee. Hi Pee Wee , Happy Birthday for yesterday ! I hope You and Carla had a great celebration . You have certainly earnt it, and deserve to enjoy, your indefinite break. Thank you for your immeasurable inspiration to me. Wishing you each the very best of health/retirement and peace with your proud memories of our live applauding and encores. Like many I’m hoping the break is only that and we will get to see the Delltones live again in the future. If not thank you for the biggest musical influence in my life and for the privelage of finally getting to meet the guys a few years back in Adelaide! HI PEEWEE,WOODY,MERV,OWEN WHEN ARE YOU BRING OUT A NEW DVD OF YOUR NEW CONCERT AND ALSO WHEN ARE YOU COMING TO TOWNSVILLE AGAIN. WHEN ARE YOU COMING BACK TO TOWNSVILLE. Thanks for the fantastic show tonight at Dooleys Lidcombe. Bet the careers counsellor laughed when Pee Wee said I’m going to make a living bom bom boming! Thank you so much for signing my new Delltones shirt at the Yamba Bowling Club concert on Friday night – much appreciated – It was an awesome concert – you guys are brilliant! My wife and I thoroughly enjoyed the concert last night at the Vikings in Canberra. At the end of a long week it was terrific to sit back, relax, laugh and sing along. Haven’t smiled so much for a long time. The love for the music that you play shined throughout the performance. Keep making the magic. We saw you in concert last night in Bendigo. The concert was wonderful, but then WE MET PEEWEE! Peewee was lovely to us and we each got a photo with him. Thankyou Peewee, we love you! Went to the Deltones Concert in Bendigo last night, it was fantastic, had the best time. Thank you for an awesome night in Bairnsdale last night. I didn’t want the show to end. Every time I see you I walk away on such a high. A sensational concert in Ballarat on Friday 25 July. These professional showmen certainly know how to rock and give the audience a wonderful night of music, harmonies, entertainment and wonderful memories. These guys are so exhilarating that they brought tears to our eyes. Thankyou for a very memorable night. Thank you for a fantastic show last night at Caloundra, I felt like a teenager all over again, I finally got my husband out of the house to see you and he loved the show, we left very happy and went to sleep still singing to ourselves, still smiling this morning. When will you be performing in Adelaide again? We went to the Delltones concert last night in Maryborough and enjoyed it very much. Thanks for coming. Loved your show last night at the Brolga Theatre in Maryborough. You are great musicians, singers and wonderful entertainers. I didn’t want the show to end!!!! We missed out on lots of Aussie bands as we are poms. It was truly wonderful to see you guys perform. Saw the show with my wife in Townsville last night (14/06/14), we really enjoy the entertainment and had a great night. It is great to see the Delltones still going strong and with so much passion and energy, also the audience going in from time to time. Thanks for the enjoyment and memories, love the music. Went to the concert in Cairns last night, thank you for an absolutely wonderful show you guys are phenomenal. Don’t ever give it away Australia will be musically deprived if that ever happens. Just home from the show in Cairns wow you guys just keep getting better everytime I see you Thank you for a wonderful show and a great night. Got a Cd signed as well and now to settle down and read your book looking forward to it. Thanks again see you again next visit. OMG !! Just brought the CD and caught the Concert at the Hali (Central Coast, NSW) tonight and absolutely loved every minute of it. You guys are truly amazing. Peewee, you’re a hoot, loved you jokes. The Fabulous Delltones ROCK !! 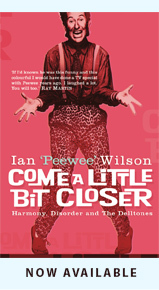 Hi Guys…ive just finished reading Come A Little Bit Closer, ………i laughed i cried….thoroughly enjoyed it..
Hey guys – I have a big grin on my face as I type this. To bring some mirth into my 17-year-old daughter’s post-HSC, pre-university period I’ve been playing “Get a Job” with the speakers turned up. She – and I, actually – find it hard to believe it was from the 80s. It was so tightly produced and snappy that it would be cutting edge if released today. Now, thanks to you, the next generation is bopping. Fantastic show at Batemans Bay last night. My husband and our 24 year old daughter (spanning the generations) had an awesome time. So so glad we saw you guys. Hey Guys we saw your show at Twin Towns last Saturday night. What a brilliant show. I have always believed that you have to have a big opening to a show and you delivered big time. That huge booming base voice sounding out while when the house lights were down and the “black & white” opening was brilliant. I think it is a great idea that Peewee does sing a few songs by himself. I’m quite sure there are many songs that your unique talent would do justice to. Look forward to seeing you in south east Queensland or twin Towns in 2014. Your work ethic encourages me to keep going in my job even though i’m officially over the retirement age. Great Show in Mandurah last night, Keep it up guys we want to see you back again. had a fantastic night in Mandurah …25/5/13 awesome . Hi Guys, really enjoyed your concert here in Pirie on the 18th April, great to see you again, I just reminded of a song you might think about next time you review the set list, “Elvira” by the Oak Ridge Boys, be great fun to hear you do that one, I hope you are enjoying your WA tour! Just finished reading PeeWee’s book – really interesting story with equally interesting views on life. Loved all the stories about early rock and roll – imagine walking in to a DJ (Bob Rodgers), who sends you straight away to a major promoter (Lee Gordon) and meeting one of the then huge stars (Johnny O’Keefe). And that’s just on your first day of your recording career!! Great story, well told, one of the best rock books I’ve read in a long time. Brought back many memories of seeing the Delltones on Bandstand. Big Hugs for Peewee, Owen, Merv and Woody. I saw and enjoyd the Delltones in Bathurst last night. What a buzz, for a moment I was back when and the daily troubles didn’t matter. Thanks! 14-4-2013Great show last night at the Norwood Concert Hall guys Have been going to your concerts, since my Husband & i first met, it was our first date ,Peewee you are the best . Fantastic show tonight at Norwood, you guys are brilliant ! I’ve been listening to you since I was a child and I loved introducing my US hubbie who is also now a fan. Great harmonies, fantastic energy and brilliant repartee by Peewee, of course !! (Maybe a different venue next time though, that wasnt so good) Cant wait to introduce my kids to your live music next time. Norwood town hall..april 13 2013. Absolutely faultless show..harmonies spot on and musically brilliant. Can’t wait to see them again. My mother nicknamed me Pee Wee after I tried imitating Pee Wee Wilson when I was a toddler and the name has stuck with me for 50 years. My first Delltones Concert was in 1984 in Albury NSW and since I have tried to get to other concerts. I introduced my 2 daughters to the Delltones at the Rock n Roll rendezvous some years ago and they have the same passion for this wonderful team of musicians that I do. We all can’t wait until the 13th April at Norwood to see you all again. Looking forward to another after show chat too if you are up for it. Keep on rockin guys! Can remember seeing you guys in kalgoolie western australia when I was about 7!! Loved you guys then and still do now am so excited that you are touring and have just purchased my tickets!! Hi Peewee, Hope you had a great birthday on Monday…we were thinking of you. Love and best wishes from The Lindsay Family. What a great show you guys put on last night in Burnie Tasmania (13/2/2013), really loved it,you guys are fantastic I took 4 friends with me and they all loved it too…..keep up the great work. had the most awsome arvo yesterday with the bset music ever and also thanku for having photo taken with me and mum …. just went to your concert at forbes it was great,is there a fifth deltone named danny, iwas wondering why he wasnt with you this time round. Why no Roy Orbison covers? Not even his song about the Civil War? Where’ve you been? Friday night in Bendigo. Absolutely brilliant guys. Still as great as ever. Last saw you in about 1994 when you released the Sunshine Club Album. Went and saw your show at the Wellington Entertainment Centre at Sale, Vic on Friday the 24th August. Absolutely fantastic have loved your music and entertainment since I was a teenager.In later years have seen your shows at the Moama Bowling Club. Loved them now and love them still,” Keep on Rocking”! Just to say I thought your solo drum work was fantastic. Keep up the good work. From front row seat number 12 at the Ballarat concert on Friday August 17th, 2012 :). Saw your concert in Ballarat on 17th August 2012. Great show and great to hear all the old tunes again. Saw your last show here 2 years ago. Keep up the fantastic work. Hope to see you in Ballarat again soon. Saw your concert in Ballarat on Friday night (17th August 2012) with my mum and we both thought it was fantastic. You did a really great job of Cold Chisel’s ‘Forever Now'(believe me because I am also a fan of Jimmy Barnes & Cold Chisel). The group still has it after all these years. From the front row seat number 12. Saw the show in Frankston, fantastic as usual. Great new song Earth Angel included. Love to see Rama Lama Ding Dong back on the list. My brother decided to take our mother to see your concert last night for her birthday and totally loved it and I came over from Adelaide to see you sing and was really hoping you will be coming to Adelaide as my husband would also love to see you as he is a rocker from way back, and still lost in the 50’s. thanks again, you were awesome.ps, please come over to us in Adelaide. Hi guys. Just arrived home from your show in Ballarat. Fantastic show, looking forward to your return. Thank you, Peewee, for giving free tickets to the first caller to Bob and Judy on 3RPP. We had an amazing night and, for two hours, I felt 30 years younger! Thank you for a wonderful concert in Wagga Wagga last Saturday night. You are an amazing group and so loved by so many of us. You had everyone in the palm of your hands & wanting more. Please come back again soon. Saw you at albury on the 3rd, and loved it, even took the inlaws who had never heard you before, they were blown away by your harmonies and the fantastic music, i last saw you in perth in 98, it was the big four o tour, and you’ve still got it, keep on rockin boys. We can’t wait to see your your concert in Wagga Wagga tomorrow night (4 August#. We saw you perform on Hamilton Island while we were honeymooning there in 1985. Today #3 August) is our 27th wedding anniversary and we are celebrating with you again!! Got great seats up front and we are excited! Amazing conceert at Sawtell last night, 4th time we have seen you and like a good wine you are getting better with age. Pee Wee don’t forget you have a zipper in those pink trousers!!!!!! Hi Guys Your concert in Ipswich tonight just fantastic, I grew up watching you on Bandstand and Six O’Clock Rock. Mum and Dad were singing along too they are now 82 and 83. Thanks again for a great night. See you next year. Keep on rockin….. Thank you for such a great night of entertainment and showmanship at the Caloundra RSl 30/6/12.You all still have the wow factor.Keep rocking with those great songs. I was at your performance at the Civic Theatre in Townsville on Friday night(22-6-2012). It was fantastic and you guys deserve a big congratulations and thank you for coming to Townsville. It was magic. I hope we get to see you again soon. Nice to see you again carla, thankyou for letting me & my mother inlaw have a chat to the guys,your a doll. Peewee,Merv,Owen & Woody,Loved the show,seen the last two shows in Emerald, this time Capella. You guys rock, hope to see you in Emerald again in the near future & hope you get over your cold soon Woody. kyra has decided to give especially you my new email address for especially you top contact me and could especially you nicely tell Woody Finlayson from off Kyra Semmler that to rest up plenty and to take it easy eventually to have a full speedy recovery from the head cold and eventually it will go away and Woody has my sympathy from off Kyra Semmler all because I do know what it’s like to have a head cold about myself having to have had a head cold back in May 2012 and YES it’s true about me saying nicely this that there’s one good medicine Woody can have to fix his head cold up is casually having a beer after the concert of The Delltones in the next towns and States in 2012 Carla. Kyra has spoken nicely to Angus And Robertson over The Shopping Fair and especially you can promote and sign copies of your book early next Year in 2013 and Angus And Roberston said It wasn’t a problem only for especially you here in Rockhampton. Kyra can nicely tell especially you that I work as a Volunteer at The RSPCA PetShop at 58 William Street here in Rockhampton. I can’t wait to see especially you come back to promote your book next Year in 2013 at Angus And Robertson over at The Shopping Fair here in Rockhampton. Great show fellas, even when you lost power. So in tune with each other, really enjoyed your show at the Summer Garden Theatre- Bowen, hurry back for another great night . thanks Peewee & boys for the memories, going to your rocky show tonight, to enjoy your timeless music,you will never grow old. Norwood Concert Hall in Adelaide SA in 2013, please come back soon!! Enjoyed the Delltones show last night at the Dalby RSL. The usual pure enjoyment, singing and listening to the guys. I was lucky enough to win the Raffle that the RSL won. I was called up to the stage to collect my prizes, but the HIGHLIGHT of my night/life, was to be kissed on the cheek by a sweaty PEEWEE. My God, he’s hot, he’s so damn hot. And what a truly wonderful voice he has. Thanks for the fabulous night guys, and will see you again. We have seen the delltones every time they have been to Warwick R.S.L. We have always enjoyed every minute of the show. We would like to congratulate The Delltones for a wonderful show. You guys are fantastic. The next time you come back to Warwick, we will definitly be in the crowd. Cheers and keep up the wonderful entertaining. We’d never heard of the Delltones but our Sydney friends insisted we go to your show at Junior’s last month. Turned out to be one of the highlights of our first trip to Australia – along with the cassowary sighting, the rain and the Reef – just fabulous! Wish you’d do a Canadian tour!!! Hadn’t seen The Delltones since the mid 1980s but finally put that right at the Liverpool Catholic Club on March 31. What more can I say. Magical. Fabulous. Brilliant. Enjoyed every single minute. Can’t wait to see the show again!!! From a 1957 American Teen Rocker. You guys are great. Especially love Rama Lama Ding Dong. Second Lyn’s comment please come back to Norwood Concert Hall in Adelaide as part of this tour can’t wait to see another show. I have been a fan of the Dellies since I was 9 years old, now at 62 I still haven’t out grown the Delltones. Love your music, just wish Peewee would do more solo tracks, love his voice. Hoping to maybe see you in Adelaide again soon. Many thanks for all the wonderfull years I have had listening to you. Keep up the good work guys, love the tunes. Glad to see the 2012 gigs are up, already booked to see you guys in Frankston when you all return to Vic. Look forward to it, take care. Hey when can I expect my Kuzzin Merv to tour down in Wagga Wagga again would be good to see him after over 20 years. Merry Christmas to you and your families and an safe new Year. Look forward to see you guys at an gig in 2012. WOW!!!!! Saw you last night at Wellington Point – we loved every second of it. You guys give 110%. We would have had you playing all night if we’d had our way – I know….you definitely deserved a rest!! Thank you…thank you…We’ll be keeping a very watchful eye out so that we catch you next time you are in the Brisbane area. hey guy’s in 2009 my mum bugged me to go see you guy’s but no one would go with you, i told her last year 2010 that if you guy’s came i would see you with her and i ened up having a great time being onnly 16 i wasn’t sure what your music would of been like but it was great we were also planning on goin to see you guy’s this year and dragging my best friend along two till we read that you weren’t comming to Orange this year, i guess well ahve to stick to teh CD instead, wish you guy’s were comming here but there is alway’s next year. great show in nowra last night,bringing back many happy memories. Love Merv’s energy and sense of fun, great night. Well, the day has come. I am heading into Batemans Bay tomorrow (Sunday 25 September) to see the Delltones, my autograph book (from the 60s) in my hand. I am hoping to get your autographs once again. Look forward to seeing the show. hi guys love your music can I please have an autograph of all of you in the mail please 34 Chapman Street Cooma NSW 2630 thank you .ps when are you coming to cooma again ? hi guys, i have been going to your concerts for 26 years and i love you as much as ever. i took my 12 year old daughter to your concert last time and she loved you too. please come to bendigo or geelong soon. Just wondering if you remember me and Dane Road in Ealing, London my brother Barry found an article about the Delltones and sent to me. It certainly brought back some memoies of you and your mum and brother and or trip down memory lane and the visit to the Shetland Islands, can’t believe it’s getting on for 4p0 years ago. Hope you are well, I am, would be great to hear from you. Saw the ‘boys’ at Devonport last Thursday. What a great show, we all went home with sore feet from tapping out the beat, no voice from singing the songs, and sore hands from all the clapping. I LOVE THE DELTONES…… iv seen them twice this week at Burnie and Launceston. who said that some one young can’t love old music… :) keep dancing!!! I LOVE THE DELTONES, i went to see them at burnie front row and launceston second row!! i’m 16, and who says i can’t love old music…. Had a fantastic time at the Delltones on wednesday night in Burnie Still haven’t got any voice but it is worth losing it they are fantastic and can’t wait for them to come back. Well the day has arrived, my friends and myself are going to see the DELLTONES tonight in Burnie, Tassie and we are so looking forward to it. I also found 2 records of the original Delltones at a market and was so pleased. I hope everyone else enjoys theem like I do. I am so thrilled to know your coming to Adelaide :) My husband & I attened your concert in Adelaide for our 1st wedding anniversary in November 1995 & now we are hoping to attend this one as an early 17th wedding anniversary present so fingers crossed :D. I have been a HUGE fan since I was knee high to a grasshopper & I hope to see you going for years to come. Fantastic singers,songs & all round greats. Hi Peewee, Danny, Owen, Merv, Woody and Carla. We had another wonderful evening at Port Macquarie’s “Wintersun” with you all. That show was our 29th gig with the fabulous Delltones having seen and enjoyed shows in the northern tablelands, north coast and hunter regions of NSW and we’re no finished yet. Living in Armidale back in the 80’s, we have fond memories of seeing two shows in one weekend at Tamworth and Inverell, try and work that one out! Looks like we’ll be Rocking The Boat in November for our 30th anniversary. Thanks again for the journey. Went and saw the show in Muswellbrook on the 17th of June and it was a brillant show. Peewee, Danny, Owen, Merv & Woody my husband and me saw you for the first time in Bunbury and it was FANTASTICLY AWESOME !! can’t wait for you all to come back love love loved the show. Enjoyed another great show in Mandurah on Saturday night,dont wait so long to come back. Saw the guys at Mandurah last night. Absolutely awesome show. Beats the hell out of all this modern computerised crap. Hope the next one isnt too far away. Well done and keep bopping boys !!! A Mother’s Day present from our children and a trip to Narrogin and another trip down memory lane. A wonderful night of entertainment and great to hear some terrific music from splendid performers. Keep ageing as you are and you will live forever. I now have two new CD’s to Bop do Wop down the road with. Went to the concert in Albany WA last night.Well done,more songs than any other group I’ve been to, extremely well done and exceptionally entertaining. Well Done guys! Hi guys, glad to see you are back on the road. I am in Melbourne but may catch you in Devonport, Tas. Still enjoying the DVD, your music keeps me rock’in. Keep fit Danny. When are you going to come back to Darwin??? We miss you!! i new the deltones from when i was a child in queensland around the 1960s my dad was denis and we had a music store we also new lucky star. they use to come to our house . i would have been about 5 or 6 years old. i use to sit on peewees lap and listen to their music my mother is norma. i do hope you remember us. I grew up in the 50’s and 60’s and, over the years that kind of music has sadly gone by the wayside. 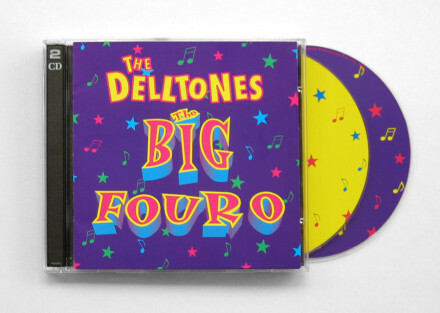 Luckily I discovered the Delltones and I must say, you are an extremely welcome relief to some of the music of today and bring back some of the best years of my life. Thank you.